‘Continuum’ is a 52-minute audiovisual performance by Félicie d’Estienne d’Orves produced in tribute to the electronic piece «Koume» (1993) by the French composer Eliane Radigue. The show was commissioned by Centre Pompidou in Paris to be presented for the fiftieth anniversary of the first man on the Moon in 2019. ‘Continuum’ is a reconstruction of a sunset on stage as could be observed on Mars. Félicie d’Estienne d’Orves envisioned combining progressive, imperceptible frequency variations and sustained drones from Eliane Radigue’s music, with the temporal and visual continuum of a Martian sunset. The sun doesn’t actually set; the Earth rotates around the sun. This endlessly repeated, perpetual movement is a model of an eternal beginning again. This term ‘space- time continuum’, also taken from relativistic mechanics, designates a space of which the 4th dimension would be time. On Mars the sunset is drawn out. As a result of microdust the twilight is lengthy and extra- colourful. 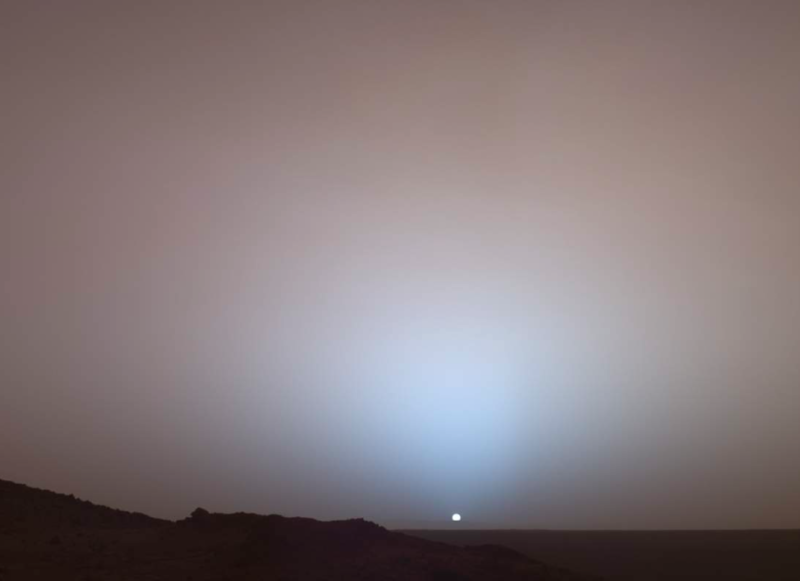 Since the 1970s Mars rovers Lander, Viking, Spirit, Opportunity and more recently Curiosity have captured images of a bluish setting sun gradually lapsing into an orangey pink hue at its zenith. The term ‘sunset’ describes an appearance. This landscape with its inverted colours seen from Mars, disturb (alter) our perception of an unchanging horizon. Mars may not be an inhabited planet, but studying its environment and atmosphere is the starting point for research into signs of life in extra-solar systems. There are other horizons; it’s a model. The switch from day to night is a turning point on the surface of Mars, much more extreme than the one experienced on Earth. At nightfall, the ambience is icy, the temperature drops to -100°C. The musical piece ‘Koume’ by Eliane Radigue, chapter III (51’17) of the ‘Trilogy of Death’ produced in 1998 by the composer, also conveys this dip. The symbolism and temporal structure of the piece, a slow unwinding culminating in maximum intensity at 35 minutes to then gradually decrease. The soundtrack will be broadcast with surround sound in collaboration with the musician. The temporality of the music corresponds to the average length of a sunset on Mars. 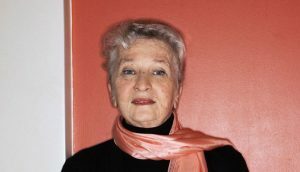 Éliane Radigue, French composer, born in 1932. Her choice and exclusive use of continuous sounds, known as drones, places her aesthetic at the crossroads of minimalist, electronic and spectral trends. The spiritual dimension of her pieces lends her music a meditative character. Until 2000, she composed her works using an ARP 2500 modular system and tape recorders. Since 2002, she has worked with several musicians creating pieces for acoustic instruments. ‘Éliane Radigue’s music is a mesmerizing experience of time and space. Comprising broad vibration flows, it is both monumental and infinitely discreet. lives and works in Paris. The work of Félicie d’Estienne d’Orves combines light, sculpture and new technologies. Her research focuses on vision, its processes and conditioning. Her immersive installations use a phenomenological approach to reality, they underscore the perception of time as a continuum. 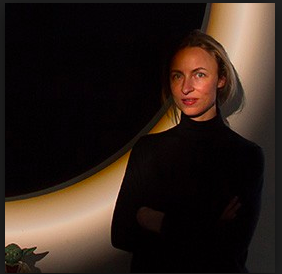 Since 2014, the artist’ researches focused on space in relation to astrophysics and to study the natural light cycles. Her work has been shown at the Centre Pompidou – Nuit Blanche (Paris) – New Art Space / Sonic Acts (Amsterdam) – Watermans Arts Center (London) – Elektra Festival / BIAN (Montreal) – Maison des Arts of Créteil (Créteil/FR) – Le Centquatre / Nemo International Biennial of Digital Arts (Paris) – OCAT (Shanghai) – ICAS (Dresden) – Aram Art Museum (Goyang /KR). The Mars sunset will be reproduced on the theatre stage by a large gradation of colour spanning 12x4m. This colourful array will be slowly motorised from the top to the bottom of the stage, and supported by a programme of projected colours. Immersed in this artificial horizon, the audience can experience this ephemeral moment, expressed as a colour and sound field, the 52-minute progressive movement of which is barely perceptible. This is combined with a 52 min video projection, adapted to projection mapping in accordance with the motorised screen, and a colour lighting system (LED profile spot) with DMX programming. So that the audience can experience it in ‘real time’, the opening of the performance presented in Paris in 2019 will be determined according to the time of the sunset on Mars at a specific point on the planet. At each performance of ‘Continuum’, the performance schedule will correspond with the Martian calendar.